Rebel Engine Entertainment recording artist Stephanie Quayle is in the top five of Macy’s iHeartRadio Rising Star Contest. The winner of the contest will open the 2016 iHeartRadio Music Festival. Fans who vote for Quayle have a chance to win a VIP trip for two to the 2016 iHeartRadio Music Festival. 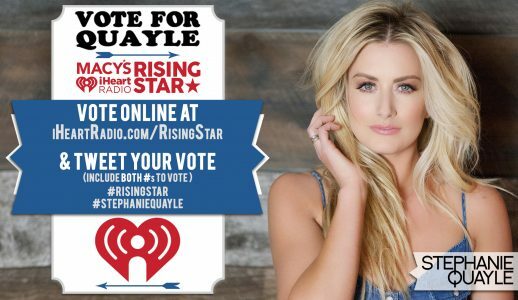 To vote for Stephanie Quayle fans can visit iHeartRadio.com/RisingStar by logging in with an email address or Facebook account. To vote on Twitter use hashtag #RisingStar and #StephanieQuayle. Fans who vote online or on twitter can also enter to win a VIP Trip for two to the iHeartRadio Music Festival 2016 including tickets for both nights as well as entry to the Festival Village, airfare, accommodations and an exclusive meet-and-greet with the Macy’s iHeartRadio Rising Star winner. Add #Sweepstakes to your #StephanieQuayle #RisingStar twitter vote to enter to win the VIP Trip. Online and Twitter voters can vote up to 50 times per day, retweets will count as votes, for a total of 100 votes per day. Voting for the Top Five will close July 3rd at midnight. The winner of the contest will be announced on July 6th. June 10 – Whiskey Bent – Nashville, Tenn.
June 11 – Durango Music Spot – Nashville, Tenn.
June 15 – Shooting With The Stars – Grand Junction, Colo.
June 16 – Country Jam Colorado – Mack, Colo.
June 17 – Headwaters Country Jam – Three Forks, Mont. June 18 – Big Horn Country Music Festival – Sheridan, Wyo. July 01 – Greeley Stampede – Greeley, Colo.
For more information on Stephanie Quayle visit stephaniequayle.com and follow her on Facebook and Twitter.